When choosing between acrylic or glass aquariums, there are many attractive and practical advantages, which make acrylic a wise choice. Colors are displayed more vividly and true in acrylic aquariums. This is because acrylic is clearer than glass, allowing up to 92% of light to pass through. Acrylic aquariums photograph much better than glass, as well. Because acrylic is a more flexible material than glass, we can Make wider variety of shapes from bow-front to bubble-shaped. Such shapes provide seamless panoramic views, and more versatile viewing angles. There are sizes and shapes to complement any decor or environment, making it more practical to display an aquarium almost anywhere. Aside from the design aspect, there are other practical and important advantages. Because they are molecularity bonded (melted together), acrylic aquariums are up to 17 times stronger than silicone-glued glass tanks. The combination of strength and flexibility, makes acrylic tanks better able to withstand bumps and gouges, and less likely to break or leak. This makes acrylic a safer choice in high traffic areas, small spaces, and around children. If the tank does get a few scratches, they can be easily buffed out, unlike glass. The durability of acrylic tanks not only minimizes the risk of serious damage to the aquarium itself, but helps prevent water damage to floors, property, and more importantly, physical injury to people and pets. In addition to being stronger and more flexible than glass, acrylic aquariums are up to 48% lighter! This makes it much easier to move, whether simply rearranging your space, or transporting it miles away. It would seem that an acrylic aquarium purchase is the most sensible purchase for a majority of aquarium keepers due to the strength, clarity, clearer seams, half the weight, variety of shapes, and classier look. 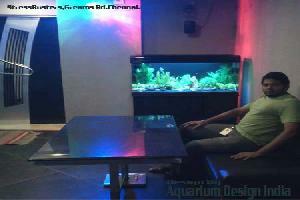 Keywords : Residential Aquarium, Acrylic Aquarium,Moulded glass aquarium chennai,glass aquarium manufacturer in chennai,aquarium tank manufacturer in chennai,aquarium decorater in chennai,best aquarium design in chennai,aquarium consultent in chennai,aquarium shop in chennai,aquarium show room in chennai,Planted aquarium display in chennai,planted aquarium gallary in chennai,marine aquarium display tank in chennai,Marine gallary chennai.